A CWE loft uses soft colors, classic materials and rustic elements to create a new take on modern decor. With its exposed brick wall, sculptural rug, sleek drapes and tonal palette of soothing grays and taupes, this dining room in a Central West End loft strikes a warm, modern vibe. 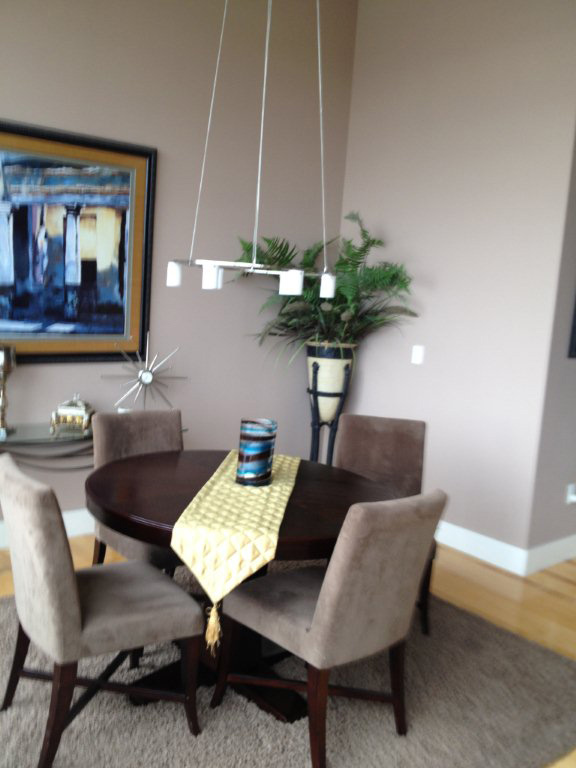 But when Joni Spear of Joni Spear Interior Design first saw her client’s space, it was a bit plain Jane. “It was pleasant, but it looked almost like a model home—it lacked pizzazz,” she explains. So Joni began to add some interest to the space, removing the wall-to-wall carpet in favor of a rug and adding window treatments to soften the view. The wall color would remain—the homeowner had recently had the space painted and didn’t want a lot of color. “But I had a nice palette to work with; the color is very neutral,” Joni says. Instead of vibrant color, she relied on rich texture to add depth, using wool mohair on the back of the chairs, raw silk in the drapes and a rug with varied piles, resulting in a sculptural feel. Throughout the open loft, Joni combined antiques, one-of-a-kind pieces, rustic elements and modern art, and she continued this approach in the dining room. 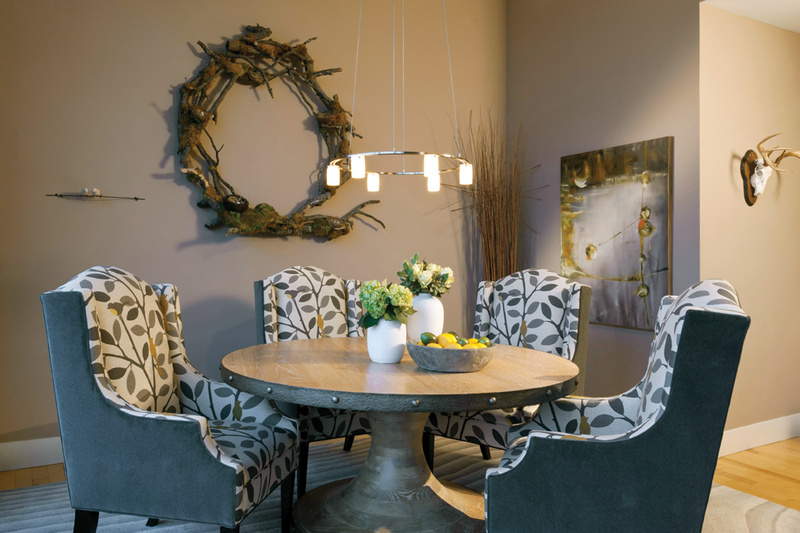 The wood table is rustic, but its metal border lends it a modern edge, for example, and a modern print on the wing back chairs updates their classic form. The result is simultaneously cottage chic and quite modern. “Even though each piece might not be considered ‘modern’; all together, it’s a very clean, modern space,” Joni says.